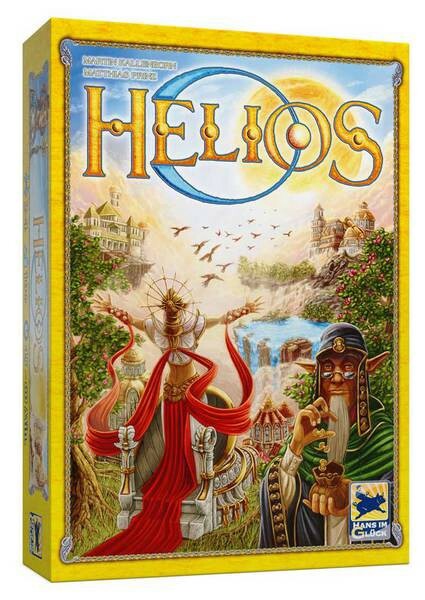 I design board games in my spare time for almost 10 years now and although I published several games so far, the upcoming release of HELIOS is something special for me. It’s a board game I’ve been working on with my friend Martin for over 5 years. It’s also one of my games with the longest history, one I deeply believe in and is brought to life by a publisher that I admire since I started gaming and game development in the first place. This is how we got there. Martin came in touch and asked if we could develop a game together. He knew I was designing games for some time and he also wanted to develop some of his ideas. Since we shared the same interest in computer games, music and board games, I agreed without hesitation. We soon discovered that this was a perfect match. Martin would come up with wild ideas and crazy settings he’d like to explore, and I could bring in my broad experience in game design, balancing and publisher relationships. Our first attempt in Fall 2008 was to build a complex strategy game called Preterra. Players were in control of civilization leaders that just landed on an ancient planet. That, of course, is in need for love and agriculture. 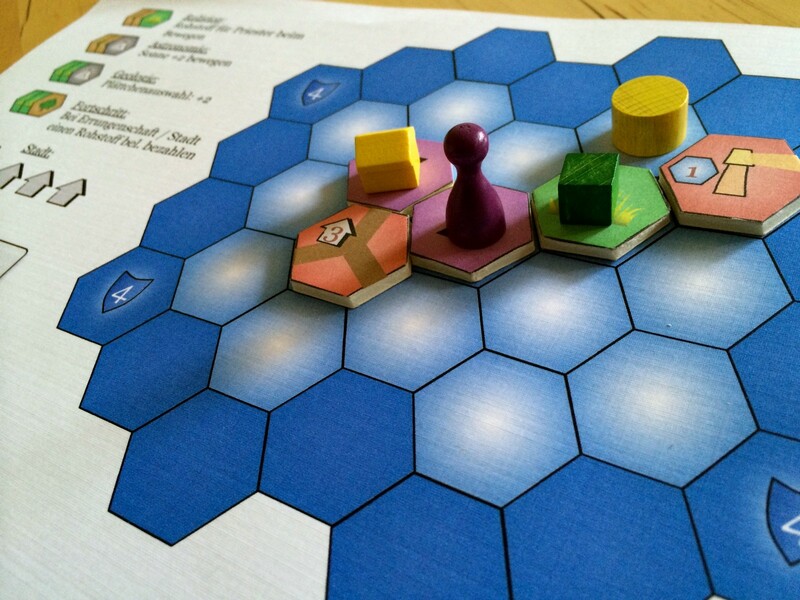 We were inspired by Sid Meier’s Alpha Centauri. We later changed the setting to Mayas and renamed the game to Chilan. You had to built pyramids and obelisks, collect gems and move your high priests around the board. 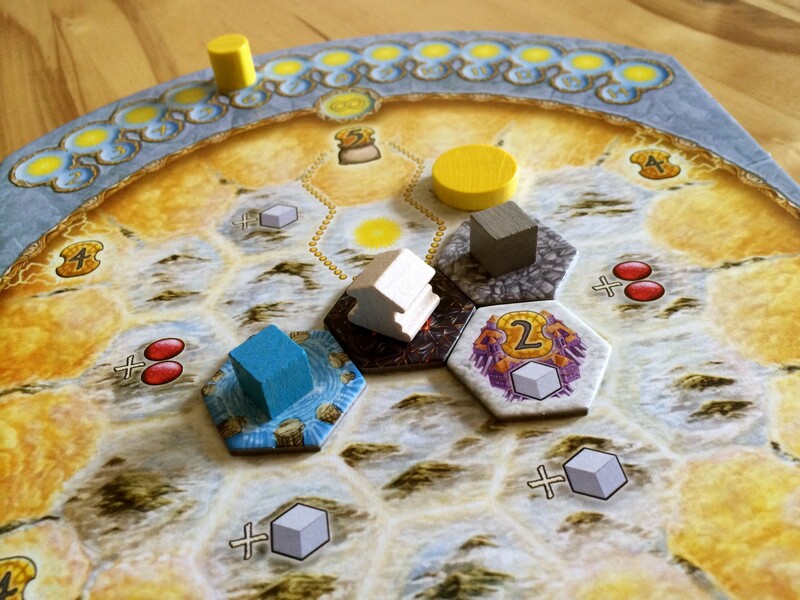 A central element of the game was a big sun stone that moved around the game board and activated certain parts of it and thus give you advantages. All those ideas ultimately led to a playable prototype that we showed to some publishers at the worlds biggest Toy Fair in Nürnberg in 2009 and at the Game Designer Gathering in Göttingen. Obviously without success. Publishers criticised the abstract nature of the game and that it allowed too much optimisation and thinking about the available actions. We decided that we need to modify gameplay and setting radically. What came next was the first major revision of the game. The breakthrough idea was to get rid of the central game board and give players their own small boards, where they could build and develop their own continents on. We dropped almost all basic concepts of Chilan, but kept the sun that moves around your continent and activates parts of it. There were four different kinds of action: Build land, Build temple, Move priest, Move sun. Basically you had to raise land to expand your empire and build temples on top of it to make it more valuable. But you could only do this if there’s the priest nearby. The sun moved around your continent and gave you resources when it shined on land tiles or victory points when it shined on temples. I also developed a new mechanism for action choosing that I was very proud of. It allowed other players to do a random action on other players turns. I showed Tahbia to several publishers in Nuremberg 2011. Among them was Hans im Glück, the well acclaimed publisher of bestselling games like Carcassonne, Thurn & Taxis (one of my personal favorites) and Dominion. Editor Michael Fronia immediately saw potential in the idea and asked to get the game for playtesting. What followed is common in the industry: You have to wait, wait, wait. Publishers receive tons of prototypes each year. Some are just scribbled on paper and barely playable, others almost ready for production. To find the gems among them is like finding a needle in a haystack. After some weeks we received our first feedback: The game was well received in the play tests, but there were several things that needed rework. Moritz Brunnhofer, Hans im Glück’s CEO, told us that they had changed several parts of the game to streamline it: They got rid of the priest, dumped my beloved action choosing mechanism and asked for more strategic possibilities. It’s always the same: At first your frustrated getting a feedback that criticises your work. Mechanisms, that you put hours and hours of brain work in, get just ripped out. But after some days, motivation comes back and you realise that these decisions really were for the best of the game. A priest walking on my continent? How stupid is that! Random actions on other players turn? Well … maybe use that in a different game. Wow, they were really publishing our game! 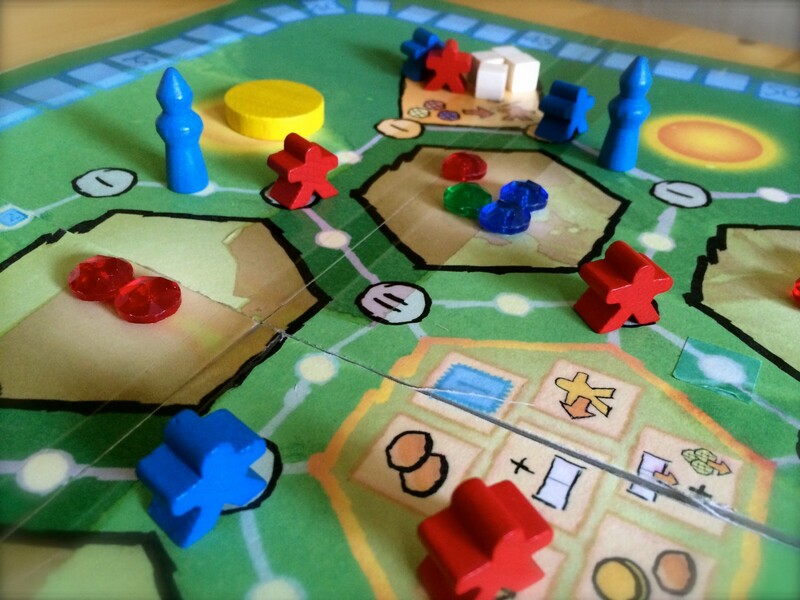 Once we all agreed that Hans im Glück would publish Tahbia, we handed our latest prototype over to the talented hands of Moritz, Dirk, Michael, Schorsch, Jasmin and Bernd. Together with their loyal play testers and sparring partners, they turned the game inside out and improved it in almost every aspect. Some changes were met with our excitement, others let to heavy discussion. Editor Jasmin Weigand played the game over and over again with different groups, tested almost every strategy and combination of actions. That’s why she also wrote the rule book. A huge step forward on setting and handling came in, when illustrator Dennis Lohausen joined the team. He played the game — still with our own hideous illustrations — and immediately had a bag full of creative ideas. Our game always took place on a fictional world (“Tahbia”) and you play a god (you create land out of nothing). He envisioned a fantasy world above the clouds where each player manages a tribe with crazy characters that preaches to the sun god. His first scribbles were met with excitement so we let Dennis go the full way with the story. It turned out pretty awesome. HELIOS was finally presented to the public at the Toy Fair Nürnberg 2014, almost exactly 3 years after I showed the game to Michael Fronia at the same place. So here we are. It took us 5 years from the first sketches to the final product. It’s so cool that all of our and the publishers hard work let to a game that others can enjoy. But we’ve come a long way. A way most people and players usually don’t think of when they play a game. That’s kind of sad, because most games disappear from the market 2–3 years after their release. Out of over 1.000 new games that gets published every year, only a handful will be remembered. I’m curious if our game will be one of them. Partner and Co-Founder at Crispy Mountain where we do internet stuff. Designing board games in my spare time. Auf zum Atem!